Well maybe a little something. I tried on the subway socks (I really have to come up with a better name!) and like how tall they were (what was I thinking 8 inches? I generally like 8 or so inches from bottom of heel (flat) to cuff—and with over 6.5 inches of leg knit, and 2.5 inch heel flap—the flap is started—(and almost done)--these socks will be over 8 inches --and quite tall enough! 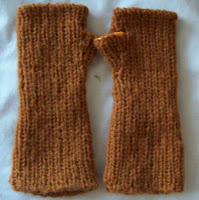 These aren’t finished --the thumb needs a row or two of stitching and a bind off--see the orange stitch holder (right glove). They are simple enough 1 X 1 ribbing—the only detail—are the cast on and bind off (both are tubular) I learned to graft long ago (exactly when is lost in the mist of time) and when I do a tubular, grafted cast off—I do it right from the working needle. Many directions start with by dividing the knit onto one needle, and the purl onto another needle, and then grafting (a standard kitchener stitch)--but that is a PITA to do. At the end of the round, I go into last stitch and come out of the very first stitch (the marker in the stitch helps me find it!) and the same with the last purl. Then the thread gets passed back into a stitch, and gets woven in. Making a perfectly bound off tubular edge. I know some are stumped by grafting, but I never found it that hard—and because I don’t think it is difficult, I do it frequently, and it just gets easier and easier. Picking it up, I remembered why I started it…Yummy! The ‘white’ is cotton and silk blend—and it’s not really white—the silk strands are shades of blue and pink –variegated from very pale to medium pastel—stranded with a natural white cotton. It's made from 8 super fine plys-- 4 of silk, 4 of cotton—and a yarn that knits up nicely on a size 5 needle--though it is is a bit splitty. The blue is not a pure blue either but has a pinkish/purplish halo—and it’s a wool and silk blend—so it too has a lovely hand—I think the colors go well together—and both are silky enough to make a very elegant little scarf. The pattern is dead simple--2 rows of stocking knit (the blue) 2 rows of garter (with the ridge on front) of the white. Gauge is about 7 stitches to the inch/8 rows to the inch. 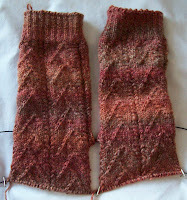 Its knit pretty dense-It might have been better knit looser and drapier... but well.. it is what it is. Frequently, I've found, even single balls are great yarns for a scarfs. But these were small 50g balls. Neither was enough for scarf on their own, but paired up like this--Perfect! (The scarf is about 4 inches wide, and will be at least 24 inches long and likely closer to 30 inches—(it’s so hard to tell!) before I run out of yarn. Definitely do finish that scarf! The yarn sounds heavenly.